Do not disable the IDE / SATA devices, will have the chance to cause the Blue Screen WIN7 start. Run as administrator command prompt, manually enter "powercfg-h off, sleep mode is turned off, the the C disk hibernation file will be deleted. Delete the backup, turn off system protection (Computer Right Properties - Advanced System Settings - System Protection). Files in these directories can be deleted encountered the problem of insufficient permissions, you can delete these files start with PE system. Server: Server service provides file sharing, remote management, and other services. If you do not need access to sharing continue to disable the TCP / IP NetBIOS Helper Workstation. 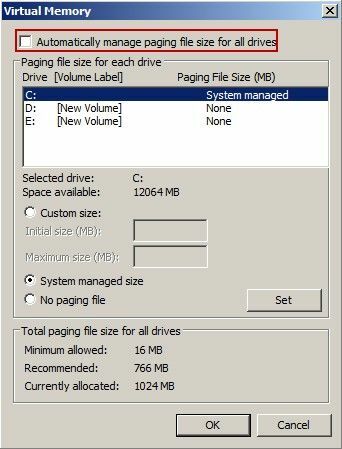 "Virtual Memory" dialog box, uncheck the "Automatically manage paging file size for all drives" check box and click the "OK" button (Figure 1-1). Operating system restore point management: a detailed reference to the "System Restore Point Management". UAC settings: a detailed reference to the "UAC Setup". Close NIC flow control: Detailed reference "Client network optimization". Service optimization: a detailed reference to the "System Optimization". Except these startup application, all others should be stopped so client boots faster and gets to desktop quicker.